We have been working on a FREE map locating various sculptures, monuments and fountains for you to explore anytime of the day for free. The FREE map is available from the Aigantighe. The town's sculptures can no be explorered and enjoyed through a map. 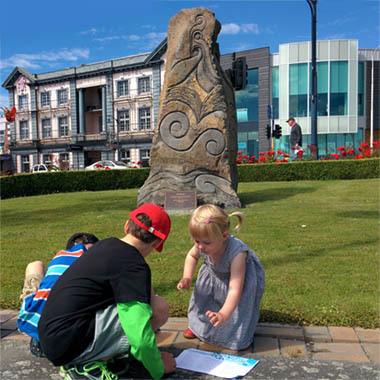 The timaru Sculpture Map was designed by the Friends of the Aigantighe Art Gallery and was launched on December 18th 2016, and offers people a chance to travel around the sculptures, learn more about their history and take part in a quiz. Friends of the Aigantighe Art Gallery president Roselyn Fauth and Aigantighe Art Gallery manager Cara Fitzgerald said the pair came up with the idea for the map when they met earlier in the year. "We were brainstoreming ways the freinds could help the gallery celebrate the arts in the region. The map includes a quiz that can be completed by visiting each sculpture. Once the quiz has been completed you can use the answers to decipher the sculpture challenge on the reverse side. The maps also have a sculpture themed activity sheet, ideal for entertaining the kids. You can visit the Aigantighe to check your quiz answers and see if you got the sculpture challenge answer correct to receive a special little something. The map has been designed by Roselyn Fauth from the Friends of Aigantighe. The printing has been sponsored by The Timaru District Council. A small print run will be produced initially. We are hoping to gain feedback and suggestions to evolve the map early 2017. "As part of celebrating the arts in Timaru, The Friends of the Aigantighe are proud to present the Timaru Sculpture Hunt. We hope you enjoy discovering clues to solve the Sculpture Challenge." The Timaru sculpture Hunt map is free and available now at the Aigantighe Art Gallery. The gallery's Sculpture Garden is always open. The Gallery is open from Tuesday to Friday from 10am to 4pm, Saturday and Sundays from noon to 4pnm and closed on Mondays.